 Berlin Studios is Blackpool's original professional recording studio with a rich heritage in the British recording industry. We have over 35 years experience and employ some of the best engineers & producers in the UK. Our purpose built recording studio provides a comfortable, warm & secure environment using state of the art recording equipment with the latest software & plugins. As an industry recognised studio we have retained some of the best analogue outboard gear available, which is used alongside our digital hardware. We are one of the few studios that can still offer true analogue recording using Ampex 2" tape for that classic magnetic sound that true audio connoisseurs desire. Call today on: +44(0)1253 591169 to discuss your requirements.